Remember “Não vai ter copa” and the concerns among international media that protests would overshadow the World Cup games this June/July? As it happened, turnout at the demonstrations was far lower than many expected, and the overall legacy of the event was largely unaffected. But there may have been a reason for that. The initial round of protests in World Cup host cities in the first days of the Cup was met by a harsh crackdown by the state-level Military Police (PM), especially in São Paulo and Rio de Janeiro. In the former, local human rights group Conectas criticized the police for restricting civil liberties and acting as if a “state of emergency” had been declared, and journalists in Rio de Janeiro clearly captured footage of Rio PM officers brandishing guns and firing live ammunition to break up protests. Considering the disproportionately repressive police response to the demonstrations, it’s no wonder that they failed to gather critical mass. Indeed, this may have been an unspoken part of these states’ security strategy all along. Fortunately it appears that pressure from civil society has achieved a significant victory in limiting police repression of protests, at least in São Paulo state. As Veja and Globo report, last week a São Paulo judge issued an injunction which forbids the PM from using firearms or rubber bullets against crowds. The judge also ordered the Military Police to present a set of rules of engagement for crowd control action within 30 days. Conectas notes that the ruling comes after repeated efforts to compel the government of São Paulo to bring the actions of its military police in line with international human rights and good policing standards. Surprisingly, there is evidence that the São Paulo PM’s de facto use of rubber bullets goes against the force’s own internal regulations. News site Ponte has obtained a classified internal PM document laying out standard procedures for using rubber bullets, which specifically says that every round fired must come at the order of commanding officers, must be documented, and must be fired at the justified target’s legs from a distance of no less than 20 meters. Ponte then points to a number of protesters with photos of recent injuries sustained from being shot in the face at distances far closer than that, showing that these guidelines essentially go ignored. Following Brazilian President Dilma Rousseff’s promise to pursue political reform in her second term, the leadership of the influential PMDB party -- which wields tremendous influence as the second-largest congressional bloc -- will meet next week to assess its position on Rousseff’s proposal to hold a referendum on reforms, Reuters reports. Days after promising to establish a commission to oversee a major purge of the country’s police force, Venezuelan President Nicolas Maduro has appointed fomer police inspector and Libertador Mayor Freddy Bernal as the commission’s director, according to El Universal. Maduro announced yesterday that the commission would be in place for six months, and that changes would be made to all of the state police forces, as well as the National Police and its police academy. A meeting in Havana of the health officials from around the hemisphere -- including the United States -- ended yesterday with the release of a document putting forth several “lines of action” to prevent the spread of the Ebola virus in the Americas and continue humanitarian efforts in disease-stricken parts of West Africa. El Tiempo and RCN Noticias report that Colombia’s FARC rebels have released a statement in Havana in which the guerrillas admit to having harmed civilians in their armed activities. The According to the statement, the FARC rebels “explicitly recognize that our actions have affected civilians in different moments and circumstances throughout the conflict, which has led to prolonged and multiple major impacts,” though they deny that civilians have ever been an intended target of attacks. The New York Times reports on Chile’s approval of a carbon emissions tax last month, which made it the first country to do so in South America. The move comes as some countries, like Australia, South Korea and South Africa, appear to be backing away from previous carbon tax commitments. Yesterday, the Mexican government was called to explain its National Human Rights Program to the Inter-American Commission on Human Rights, which Spanish news agency EFE notes saw human rights organizations further criticize the government’s handling of the Iguala students’ disappearances. The AP picked up remarks by Emilio Alvarez Icaza, secretary of the Inter-American Commission, who asserted that both the Iguala disappearance and Tlatlaya military massacre point to a “grave crisis” of human rights in the country. BBC Mundo reports that the Commission is also slated to review the agreement released on Wednesday by Mexican President Enrique Peña Nieto with the parents of the 43 missing students, and is considering naming a team to oversee its implementation. BBC Mundo also has a piece looking at the work of the Argentine Forensic Anthropology Team (EAAF) in Mexico, where it has been contracted to help authorities identify the remains found in the mass graves being uncovered in Guerrero. Since arriving the EAAF has faced a number of obstacles to its work from local officials, and last week some of its members claimed that procedural errors meant they could not adequately confirm the government’s claim that none of the bodies located thus far belong to the students. Writing for The New Yorker, Francisco Goldman offers a hopeful look at the civil society response to the Iguala disappearances, which he describes as having the potential to transform the country’s corrupt political system. Making a similar argument, John Ackerman has an op-ed in the L.A. Times in which he also asserts that Mexico’s democratic development has been stunted because unlike other nations in the Americas, the country’s political class has changed little over the past few decades. Mexico’s Supreme Court has rejected a proposal by Mexico’s left to hold a popular referendum on a law backed by the Peña Nieto administration which opens up the country’s state oil monopoly to private investment. Animal Politico reports that Andres Manuel Lopez Obrador’s MORENA movement and the center-left PRD both presented challenges to the law, which were shot down in identical court rulings yesterday. The New York Times reports on the ways in which many Mexicans are increasingly mixing elements of Halloween with their Day of the Dead celebrations, a trend which some in the country view as a potential threat to its cultural traditions. It took two and a half weeks, but Bolivia’s Supreme Electoral Tribunal (TSE) has finally released the final vote count for the country’s October 12 general election. According to the TSE President Evo Morales not only won re-election, but his Movement Toward Socialism (MAS) party also secured a solid two-thirds legislative majority. La Razon reports that the TSE found that the MAS obtained 61.36 percent of the vote, while opposition leader Doria Medina’s Democratic Unity (UD) party received just 24.23 percent, followed by 9.24 percent for the Christian Democrat Party. Both the Movement without Fear (MSM) and Bolivian Green Party received less than 3 percent of the popular vote, meaning that they will both lose their formal legal status. 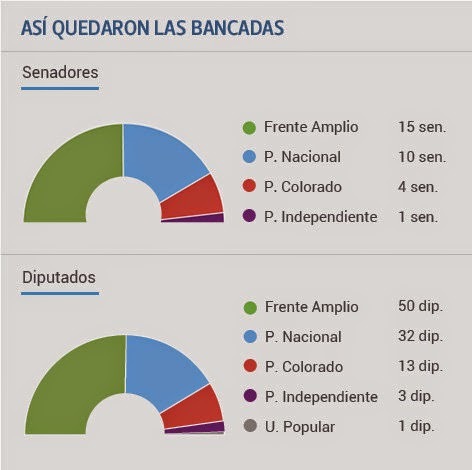 Electoral officials’ breakdown of legislative seats for the 2015-2020 period show that the MAS will control 25 of the Senate’s 36 seats and 88 out of 130 (the Associated Press reports 89) in the Chamber of Deputies, giving Morales the two-thirds supermajority he hoped for going into the vote. This is a major victory for Morales, as his party’s two-thirds majority was upset in 2011 when five lawmakers broke from the MAS coalition in opposition to the TIPNIS highway project. However, Ecuador’s Rafael Correa also made similar remarks before ultimately coming out in support of a measure allowing indefinite re-election earlier this year. Only time will tell whether Morales follows this path, but his decision will have major implications for Bolivia’s democracy for years to come, as journalist Martín Sivak wrote recently in a New York Times op-ed. Advocates of the U.S. improving its ties to Cuba, especially regarding humanitarian work in Ebola-stricken countries, should be pleased: yesterday Nelson Arboleda, the Central America director of the U.S. Centers for Disease Control and Prevention (CDC), attended an ALBA summit on Ebola in Havana, Cuba. According to Reuters, Arboleda was invited by the Pan-American Health Organization. O Globo and O Estado have both published interesting analyses of Brazil’s election results which question the standard narratives for President Dilma Rousseff’s victory. The first, by data journalist Fabio Vasconcellos, notes that a statistical comparison of areas that voted for Rousseff versus areas where many locals benefit from the popular Bolsa Familia program shows that this segment cannot account for her second-round win, as some have suggested. The latter has a solid takedown of the top seven fallacies used by pundits to explain Rousseff’s victory, with the first being that she won re-election only due to her strong support in the northeast of the country. Following Semana magazine’s report alleging that Colombian military intelligence had gathered a list of emails of journalists, human rights activists and peace negotiators with an apparent intent to spy on them, the New York Times has picked up on the story as well, noting that a former NYT reporter was also on the list. For its take on the story, La Silla Vacia suggests that it could be a product of fears within the military of a post-conflict Colombia in which officers could be investigated or lose their positions due to downsizing, among other things. Salvadoran news site El Faro looks at recently declassified Argentine intelligence documents, which show that the junta in Argentina had close security ties with the Salvadoran government in the 1970s and 1980s. Among other things, documents show that analysts in the Argentine embassy in San Salvador were closely watching the “subversive” activities of Archbishop Oscar Romero. The Miami Herald reports that the Obama administration is sending State Department official Thomas Shannon to Haiti today to speak with pro-government and opposition lawmakers there to end the gridlock that has held up long-overdue legislative and local elections. The Wall Street Journal reports on Bolivia’s recent law that allows children as young as 12 to work under contract with parental consent, and as young as 10 to receive payment for work if they remain in school. The paper offers a good report on the controversy surrounding the measure, with supporters describing it as a recognition of an unfortunate reality and critics calling it formalized child abuse. According to The Guardian, the grandson of former Chilean dictator Augusto Pinochet is rallying supporters of the late ruler around a new political party, the Orden Republicano Mi Patria. While the party is right-wing and opposes marriage equality, it is in favor of legalizing marijuana and making other reforms to the Pinochet-era constitution. In a rare sign of progress in Guatemala’s battle against impunity, El Periodico reports that a judge in the country is pursuing charges against three former police officers accused of killing the main investigator into the 1990 murder of human rights advocate and anthropologist Myrna Mack. The AP reports on a Chilean pilot project sponsored by the Daya Foundation and the Santiago municipality of La Florida to grow cannabis for medicinal purposes, a bid to provide some 200 cancer patients with cannabis oil to alleviate pain and side effects of their treatment. Where’s Peña Nieto’s Plan for the Iguala Disappearances? As the search for the 43 missing students drags on in Guerrero, Mexican President Enrique Peña Nieto is finding his agenda completely dictated by the disappearances. Though more than a month has passed since the incident, his administration appears caught off guard by the public outrage to the case and seems unable to articulate a satisfactory response. Newspaper Reforma reports that the president has postponed plans to seek congressional approval for his plans to travel to the Asia-Pacific Economic Cooperation (APEC) forum in Beijing and a G-20 leaders’ summit in Australia next month. Instead, Peña Nieto appears to be devoting his energy almost entirely to responding to the public outrage resulting from the disappearances in Iguala. According to El Universal, Peña Nieto is scheduled to receive the parents of the missing 43 later today for a closed door meeting in his official residence. Animal Politico reports that relatives of three students who were killed by police and unknown gunmen prior to the disappearances have been invited as well. Also expected to be present is Interior Minister Miguel Angel Osorio Chong. Meanwhile, the case still dominates headlines, and protests against the disappearances and police corruption in general have continued both in Iguala and across the country. The resignation of Guerrero governor Angel Aguirre has not stopped federal lawmakers from pointing fingers and exchanging allegations of facilitating the corrupt relationship between local authorities and police in Iguala that contributed to the disappearances. El Universal and El Pais report that left-wing politician Andres Manuel Lopez Obrador has been a recurring target, as he personally endorsed Jose Luis Abarca’s campaigns for mayor of Iguala, allegedly after having been informed of the local officials’ reported crime links. As the New York Times and L.A. Times report, yesterday authorities announced that suspects in the case had led them to yet another mass grave in the nearby town of Cocula, and that investigators are working to identify the remains found there. However, the fact that officials have discovered 38 bodies in ten other unrelated mass graves nearby has lowered hopes that the latest find is linked to the Iguala case. The Financial Times has a particularly astute analysis of the significance of the case to the Peña Nieto administration, criticizing the fact that the president appears not to have a plan to address the scandal and has not yet visited Iguala. The FT also takes him to task for his decision to abandon his predecessor’s narrative of a war on crime in favor of “sticking rigidly to the narrative of progress and modernization.” The piece also features input by several analysts who suggest he use his political coalition-building skills to hammer out reforms meant to assert the rule of law. The Venezuelan government is coming under increasing fire for the continued imprisonment of opposition figure Leopoldo Lopez. Spanish Prime Minister Mariano Rajoy echoed a request from the United Nations' top human rights official to free Lopez last week, prompting the Venezuelan government to recall its ambassador to the country for consultation. Yesterday, Lopez refused to appear in court in a bid to pressure officials to respond to the UN request. A bill presented to Colombia’s Congress that would legalize marijuana for medicinal use got a boost yesterday by Minister of Health Alejandro Gaviria, Radio Santa Fe and El Tiempo report. In her first major interview since re-election, Brazilian President Dilma Rousseff spoke with SBT Brasil last night about her plans for her next term. Among other things the president doubled down on her promises to promote political reforms via a popular referendum, and emphasized her support for a federal law that criminalizes homophobic speech. Police in the Brazilian state of São Paulo have released alarming statistics on the number of killings by uniformed officials so far this year. From January to September, police there killed 478 people, the highest number for the same period over the past decade and twice as many as the same period last year. Following a report by Semana magazine alleging that Colombian military intelligence officials had conducted a secret list of the personal emails of journalists, diplomats and peace negotiators, military intelligence chief Mauricio Forero has been temporarily relieved of his duties as the attorney general’s office investigates the matter. Fort the 23rd time, the United Nations General Assembly voted yesterday to overwhelmingly condemn the U.S. economic embargo against Cuba. As Reuters reports, as in the past several years the U.S. was joined only by Israel in opposing the measure, while a handful of Pacific island nations abstained. Salvadoran Defense Minister General David Munguia Payes has responded to allegations that the recent murder of Colonel Carlos Alfredo Rivas Najarro’s son had to do with Rivas’ support for investigating military human rights abuses and repealing El Salvador’s Amnesty Law, as profiled recently in InSight Crime. In remarks to news site Factum, Munguia Payes denied that the armed forces were behind the murder, saying that today’s Salvadoran military has changed drastically since the days of the country’s civil war. The AP looks at the Cuban government’s attempts to fight the country’s declining birthrate, which include expanded maternity and paternity leave, and still-unannounced special incentives for young couples to have children. Vazquez gets a second wind: This is a huge boost not only for the Frente Amplio, but for Vazquez as well. His party’s list got four more points than those of the two largest opposition parties combined (the Colorado and National Party votes together have 43.88 percent compared to the Frente’s 47.9 percent). Because the bases of the Independent Party and smaller Popular Unity parties are center-left to leftist voters disenchanted with the FA, it is safe to assume the majority of their support will transfer to Vazquez as well. Factum’s recent runoff poll, which showed the two candidates statistically tied at 48 percent for Vazquez and 47 percent for Lacalle Pou, no longer seems trustworthy, especially in light of all the major pollsters’ inability to predict Sunday’s outcome. The Frente’s still got it (and its progressive laws are safe): As El Observador reports, this is the first time since the 1940s that a Uruguayan party stands to hold onto a legislative majority for three consecutive terms. Much of the international coverage of Uruguay’s election so far (see the New York Times, Reuters) has focused on the FA’s support of progressive yet controversial legislation as a reason for its potential defeat. Yet despite opposition to marijuana legalization, abortion decriminalization (and to a lesser degree) marriage equality from large segments of the country, these measures have so far not become hot-button issues. In addition to ensuring that these initiatives will remain in place, Sunday's vote confirms that the FA has a unique ability to push the envelope without taking a hit in the polls. This has been illustrated before, however, in the wake of the October 2012 law that decriminalized abortion. The measure was opposed by 46 percent of the country, and in April 2013 51 percent of Uruguayans said they would support holding a referendum on whether to repeal it. Yet just 8.9 percent of the electorate actually came out to support an eventual referendum in a June 2013 vote, essentially leaving the issue settled. NO a la Baja: The push to lower Uruguay’s age of criminal responsibility from 18 to 16, which until recently looked guaranteed to pass, failed by six points (53 percent opposed and 46.99 in favor). Support for the initiative dropped significantly over the past year due largely to the efforts of the civil society coalition behind the creative “No a la Baja” campaign. The campaign also got a boost from Uruguay’s voting system, which required supporters of lowering the criminal responsibility age to present a slip indicating their preference alongside their party’s ballot list. Not including it was counted as a “no” vote, so the fact that the Frente Amplio and second-largest segment of the National Party did not include the slips automatically with their own lists likely made an important impact. “El Pepe” is popular: Jose “Pepe” Mujica’s signature humble, plain-spoken image has served him well politically. Some 62 percent of Uruguay’s population views him favorably, and 58 percent approve of his government, according to an October Cifra poll. This support has also translated into backing for his Popular Participation Movement (MPP) sector of the Frente Amplio. As Radio Espectador reports, the MPP’s list was the most supported among FA voters, making it the largest single FA bloc in both houses. This bucks another historical trend, as most Uruguayan presidents see their party’s internal faction lose support after leaving office, according to El Observador. The AP has an analysis of Brazilian President Dilma Rousseff’s slim victory margin in Sunday’s vote, which paired with the country’s fragmented Congress may make it difficult for her to act on her promise to push for political reforms and hold a national referendum to address demands for better public services and less corruption. The New York Times also offers a take on the results, pointing out that Rousseff’s narrow win highlights bitter divisions between the country’s rich and poor, as well as between northeast states and the more developed south. Mexican investigators looking into the disappearance of the 43 missing students in Guerrero say that suspects in custody have led them to a mass grave site about 10 miles from where the disappeared were last seen. Mexico’s attorney general, meanwhile, has told the press that the protesting students were taken first to a police station and then to a nearby town, apparently while still alive. As the peace talks in Havana progress, more FARC leaders are arriving at the negotiating table to give their two cents on the process, as Reuters noted last week. One of the latest and most controversial arrivals, according to the AFP, is alias “Edilson Romaña,” who is accused of orchestrating mass kidnappings for the rebels in recent years. La Silla Vacia looks at the hurdles that Colombian civil society faces in creating a comprehensive “movement” by uniting the various victims’ associations in the country, a process that has been held up by the fact that the groups themselves are divided over the current peace talks. Yesterday Catholic Church officials in Cuba announced that the island’s government is allowing it to build the first new church in the country in 55 years, which many interpret as a sign of Cuba’s improved relationship with the Vatican. The southern Peruvian city of Ayacucho yesterday held a ceremony to lay to rest 80 victims of the country’s bloody internal conflict, which were exhumed between 2011 and 2013. According to the AP, officials have recovered 2,925 sets of remains so far and identified 1,689, just a fraction of the 69,000 believed to have been killed. The Washington Post reports on an interesting indication of the ways in which Bolivian President Evo Morales and his MAS party have altered the identity of the country’s Aymara indigenous. In recent years ,wealthy Aymara individuals have been increasingly embracing their heritage by promoting a colorful architectural style known as “New Andean,” which is transforming the landscape of the city of El Alto. Syndicated columnist Andres Oppenheimer looks at the Buenos Aires government’s decision to move its city hall to one of the most neglected neighborhoods in the city in a bid to revitalize the area, a move he notes has worked in other cities around the hemisphere and might be applied successfully in Miami. On Sunday, both Brazilians and Uruguayans will be going to the polls. In Brazil, recent surveys have suggested that President Dilma Rousseff has widened her lead over challenger Aecio Neves. But in neighboring Uruguay, recent polls suggest that that the ruling Frente Amplio coalition isn’t having the same luck. Yesterday, Ibope and Datafolha both published the results of surveys taken earlier this week, both of which for the first time showed Rousseff leading Neves outside of the margin of error. Ibope has Rousseff beating Neves 49% to 41% of total votes (excluding null and blank votes, Rousseff has 54% to her rival’s 46), while Datafolha found 48 % for the incumbent and 42% for Neves (which would be 53 to 47% of valid votes, respectively). The Wall Street Journal reports that analysts say Dilma’s rise is a product of her campaign’s ability to secure support among working-class voters. However, the Datafolha survey suggests this is isn’t quite the full picture. As Folha reports, Datafolha’s data shows that the president’s challenger lost support across all classes in recent weeks. The pollster found that support for Neves after the first-round vote stood at 74% among upper class voters and 67% among the middle class, but that these figures have since fallen to 64% and 58%, respectively. Meanwhile in Uruguay, the governing Frente Amplio coalition has not seen a rebound similar to Rousseff’s. Polls released this week suggest the FA will fall short of the roughly 47% that most analysts suggest it needs to hold on to its legislative majority. Equipos Mori has the Frente Amplio at 43.6%, the National Party (PN) at 33.4%, the Colorado Party (PC) at 15.1% and the Independent Party (PI) at 3.1%; Cifra has FA 43%, PN 32%, PC 18% and PI 3.3%; and Factum suggests FA 44%, PN 32%, PC 15% and PI 3%). According to El Observador’s helpful projections based on these polls, in the best possible scenario for the FA, they will still lose two congressmen in the lower house. This means that no matter what, the next Congress will see far more debate and vote-wrangling than in the past five years under the FA’s controlling majority. Because the FA won’t obtain a majority of votes in the first round, there will almost certainly be a presidential runoff on November 30 between the FA’s Tabare Vazquez and the PN’s Luis Alberto Lacalle Pou. On this front the news isn’t good for the FA either. Factum, the only pollster to publish surveys on a hypothetical pairing between the two, found earlier this month that two are statistically tied at 48% for Vazquez and 47% for Lacalle Pou, with a 3 point margin of error. This gap has narrowed from September, when Factum had 50% for Vazquez and 48 for Lacalle Pou, and is a far cry from polls earlier this year. As recently as April, Vazquez enjoyed a 15-point lead over his rival, with 55% to Lacalle Pou’s 40%. Regarding Uruguay’s plebiscite to lower the age of criminal responsibility, the latest survey from leading pollster Cifra shows that 47% support the reform and 43% oppose it. However, the good news for Uruguay’s No a La Baja campaign is that this 47% will not automatically translate into votes for the measure. In order to support the initiative, voters have to present a special slip inside the sealed ballot lists of their party of choice. Not including the slip is the equivalent of not voting for the reform, which is why the Frente Amplio lists do not include them. And though the Colorado Party is automatically including the slip in its ballot lists, the National Party is divided on the issue, as El Pais has noted. While Lacalle Pou’s faction of the National Party will include it, Vice President candidate Jorge Larrañaga’s list -- the party’s second-most popular grouping -- will not. Though this seems like a minor detail, Larrañaga’s decision will likely mean the failure of the reform initiative. Though it has largely avoided becoming a major campaign issue thus far, Uruguay’s marijuana law has come into play in recent days, with both Vazquez and Lacalle Pou mentioning it in remarks to the press. Last week, the FA candidate remarked to newsmagazine Busqueda that he saw the law’s provisions on commercial sales in pharmacies as “unheard of,” though he said he would continue to implement it while carefully evaluating its effects. And as El Pais reports, in a Wednesday interview he again put some distance between himself and the law, remarking that commercial sales could potentially put pharmacies at risk of criminal attacks. Lacalle Pou, for his part, confirmed to Reuters on Wednesday if elected president he would present a bill to end sales in pharmacies, restricting it to home-growing and cannabis clubs. In the latest twist in the case of the 43 missing students from Mexico’s Guerrero state, Guerrero Governor Angel Aguirre Rivero has stepped aside to allow the state legislature to choose his successor, Animal Politico and the AP report. News site Plaza Publica has an interview with the head of Honduras’ National Anti-corruption Council, Gabriela Castellanos Lanza. Since taking office she has made a name for herself as a committed champion against abuse of public funds and criminal influence in government. InSight Crime’s David Gagne offers his take on Guatemala’s recent government-commissioned civil society report on potential drug policy reforms. In his estimation, the report’s lack of “state regulation or at least decriminalization of marijuana” represents a step backward from Guatemala’s position as a main advocate for a new approach to drugs in the hemisphere. The government of Venezuela yesterday announced the discovery of warehouses packed with food and medical goods that had been meant to illegally smuggle into neighboring Colombia, which President Nicolas Maduro held up as an example of what he has in the past called an “economic war” being waged against the country. He also said he would use decree powers to raise the maximum jail sentence for smugglers to 14 years, Ultimas Noticias reports. WOLA’s Adam Isaacson takes a look at estimates regarding the economic cost of implementing Colombia’s peace agreement, which range from $44 billion to $150 billion over the next decade. The Dominican government officially gave a response to the recently-published Inter-American Court of Human Rights ruling on its citizenship and immigration practices yesterday. As El Listin Diario reports, government spokesperson Roberto Rodriguez Marchena told reporters that the administration of President Danilo Medina “rejects” the sentence even as it continues to adhere to the Inter-American human rights system. According to Rodriguez, the government views the decision as a violation of a state’s sovereign right to decide its own citizenship requirements, enshrined in international law. But while the Medina government claims to respect the American Convention, the court’s ruling has fueled arguments among Dominican lawmakers arguing in favor of withdrawing recognition of its jurisdiction. This includes spokesmen of both major parties -- Medina’s PLD and the PRD -- in the lower house, according to El Dia. The Inter-American Court of Human Rights has ruled that the Dominican Republic is guilty of systematically deporting individuals of Haitian descent on a discriminatory basis, and that it must take steps to invalidate last year’s controversial ruling that left thousands of people effectively stateless. Yesterday, the court published its ruling on “Expelled Dominican and Haitian people v. Dominican Republic,” condemning the D.R. for human rights violations committed against Haitian migrants and Dominicans of Haitian descent in the 1990s. During this time the court found that tens of thousands of people had been made victims of arbitrary detention and expulsion, violating their rights to a nationality, to recognition as a person before the law and to freedom of movement and residence as laid out in the American Convention. The decision has been a long time coming. The case is based on a petition first submitted on behalf of 27 victims to the Inter-American Commission on Human Rights in late 1999, which the Commission passed the case on to the Court after issuing its own recommendations in 2012. But while the case focuses on violations that took place from 1990 to 2000, yesterday’s sentence goes beyond the specific facts involved, as Acento, Listin Diario and Spanish news agency EFE note. On top of ordering the D.R. to sort out the legal documentation of the 27 victims, the court took aim at the 2013 Dominican Supreme Court decision that left the legal residency and citizenship status of as many as 250,000 people in doubt. In its recommendations, the court asserts that Dominican authorities should “adopt internal legal measures” to annul the 2013 domestic court ruling, as well as sections of a controversial May 2014 law meant to implement it. This is a significant victory for Dominican civil society groups that have advocated for the rights of Haitians and people of Haitian descent in the country. Because the Dominican Republic has accepted the jurisdiction of the Inter-American Court since early 1999, the ruling is legally binding. In fact, Article 74 of the Dominican Constitution establishes that in the event of a contradiction between a national court ruling and an international one, the ruling that is most favorable to individual rights-holders takes wins out. However, in practice the Inter-American Court ruling is unlikely to bring any change, at least in the short term. As human rights expert Julia Harrington Reddy has noted, a similar judgment in 2005 went virtually ignored and did nothing to prevent last year’s Supreme Court ruling. In a press conference last night, a spokesman for President Danilo Medina told reporters that the government would need time to analyze the 160-page ruling, but would likely present an official response to the decision by Friday. The AP looks at the support for Brazilian presidential challengers Aecio Neves and Dilma Rousseff among lower middle class voters. Many analysts believe Rousseff’s aggressive marketing has given her an edge among this demographic, taking advantage of Neves’ image as defender of elite interests. In an excellent article for Foreign Policy, Rio-based journalist Miriam Wells explains why regardless of which presidential candidate wins on Sunday, they will have to work with the PMDB legislative bloc in order to govern effectively. As she notes, the PMDB’s long-standing influence and flexibility on ideological issues has effectively turned the party into a political kingmaker. Brazil is not the only country in the hemisphere that will be holding elections on Sunday. Uruguay’s general election is also slated for October 26, though polls indicate that the presidential race will go to a runoff between the ruling Frente Amplio’s Tabare Vazquez and National Party candidate Luis Alberto Lacalle Pou. As the campaigns come to a close, the three leading pollsters have released their final polls ahead of the vote. El Pais and Subrayado have good overviews of the three ( Equipos Mori: Frente Amplio 43.6%, National Party 33.4%, Colorado Party 15.1 and Independent Party 3.1%; Cifra: FA 43%, PN 32%, PC 18% y PI 3.3%; and Factum FA 44%, PN 32%, PC 15% y PI 3%), with most analysts agreeing that the ruling coalition will lose its legislative majority and that the second round presidential race is still too close to call. On Tuesday, Chile’s lower house voted to approve an education reform bill presented by President Michelle Bachelet, as La Tercera reported.The Wall Street Journal has more on the details of the bill, which will end student copayments, prevent for-profit schools from receiving state money, and eliminate restrictive admission policies. Mexican Attorney General Jesus Murillo Karam yesterday confirmed reports that Iguala Mayor Jose Luis Abarca had ordered corrupt police to detain protesting students in the town last month, out of concerns that they would disrupt a speech by his wife. Karam also said that the mayor received payments of between $150,000-$220,000 from the local criminal gang, Guerreros Unidos. The Argentine Forensic Anthropology Team (EAAF), which has been contracted to help Mexican authorities identify the remains found in the mass graves being uncovered in Guerrero, has cast doubt on the methods used by official Mexican forensic researchers. Animal Politico reports that because of potential procedural errors, two members of the EAAF told the news site that the Mexican government cannot be entirely sure that none of the 30 bodies located thus far belong to the missing students. Human Rights Watch has released a new report on anti-LGBT discrimination in Jamaica, documenting 56 cases in which people claim to have been victimized because of their sexual identity. Police investigations into these crimes were "often inadequate or lacking altogether," according to HRW. Yet another version has emerged of the events surrounding the death of 22 suspects at the hands of soldiers in the town of Tlatlaya on June 30. For two months, both state and federal officials denied that any wrongdoing had occurred, saying that all the victims had died in a shootout even as local and international press reported on witnesses’ claims that all but one of the victims had been executed. This continued until late September, when Mexico’s Defense Ministry (SEDENA) announced the arrest of eight personnel in connection with the death (this has since risen to 16). Two weeks later, the office of the Attorney General (PGR) announced that four soldiers would be prosecuted for the alleged murder of eight suspects, while the remaining 14 had been killed in an exchange of gunfire. Now, Mexico’s National Human Rights Commission (CNDH) has turned this story on its head. In a summary of the group’s own investigation (.pdf) released yesterday, CNDH President Raul Plascencia called on the SEDENA, PGR and the government of Mexico state to widen their inquiries into the Tlatlaya killings, saying that it had established that soldiers executed at least 12 and probably 15 of the 22. Contrary to the military’s claims, the initial firefight lasted no more than ten minutes, as the suspects surrendered quickly. As Animal Politico reports, the CNDH accused the soldiers of rearranging their bodies after the incident in order to make the deaths fit the official story. It remains to be seen how the government will respond to the CNDH’s non-binding recommendations, but the continued absence of the 43 disappeared students in Guerrero and the continued discovery of unrelated mass graves in the area do not exactly inspire confidence in Mexican authorities. The AFP reports that U.S. State Department source has said that the Obama administration is open to the idea of collaborating with Cuban officials to fight the Ebola outbreak in West Africa. "We welcome the opportunity to collaborate with Cuba to confront the Ebola outbreak. Cuba is making significant contributions by sending hundreds of health workers to Africa," the source reportedly told the news agency. The Wall Street Journal reports on Brazilian President Dilma Rousseff’s apparent slight surge in the polls recently, becoming the latest U.S. media outlet to profile the president’s support base among the rural and urban poor. As the search for Mexico’s missing students drags on and new graves are being uncovered, the Associated Press reports on Mexico’s difficulty with identifying remains and the slow pace of documenting disappearances. In an op-ed for the New York Times, Clarin opinion editor Fabian Bosoer and historian Federico Finchelstein criticize a new deal reached between the Argentine and Russian governments that will pave the way for a Spanish language version of the state-owned Russian news agency RT to air in the South American country. To the authors, the agreement is an example of what they describe as a regional march towards “Putin’s approach to media freedom,” in which Latin America’s populist governments are increasingly becoming hostile to independent journalism. InSight Crime offers an update on Mexico’s controversial decision to legalize the so-called “self-defense” militias in Michoacan state, noting that the recent death of a militia leader lends weight to claims that officials have failed to properly equip the groups and bring them into the ranks of the military’s Rural Defense Corps. Timothy Gill of Venezuelan Politics and Human Rights has a collection of reactions to the country’s acquisition of a UN Security Council seat last week, which range from outrage among U.S. politicians and the NYT and Washington Post editorial boards to less heated responses by regional analysts, many of whom have pointed out that the seat offers only a symbolic victory to the Maduro government. McClatchy reports on opposition to the Australian El Dorado gold mining project in El Salvador, a mine that environmentalists say would cause devastating environmental harm to affected communities. The future of the mine is being decided by a World Bank tribunal in DC, which is expected to issue a ruling sometime early next year. The Washington Post reports on the campaign efforts of Brazilian President Dilma Rousseff and her challenger Aecio Neves in the latter’s home state of Minas Gerais, noting that his record as governor there has been both attacked by critics and applauded by supporters. The Miami Herald’s Jim Wyss profiles the reactions to the Colombian peace negotiations in Havana among conflict victims, finding that despite all they have endured, many of Colombia’s 6.7 million victims are more interested in reconciliation and peace than revenge. Both Kerry and Castros’ remarks were picked up in a New York Times editorial on Sunday, which also described the potential for the U.S. (“the chief donor in the fight against Ebola”) and Cuba (“the boldest contributor”) to complement each other’s work in West Africa. “While the United States and several other wealthy countries have been happy to pledge funds, only Cuba and a few nongovernmental organizations are offering what is most needed: medical professionals in the field,” the NYT noted. At the very least, the paper called for infected Cubans to be given treatment at a U.S. military health center in Liberia. This gesture would be especially important given that, according to CNN, Cuban healthcare workers in West Africa have agreed not to be repatriated to Cuba for treatment if they are infected, in order to avoid spreading the illness. The invitation is significant in that it provides the Obama administration with an opening to seize on all the recent praise of Cuba’s efforts, improving the fight against Ebola as well as strengthening relations with Havana. The Herald also has more on the ALBA bloc summit, which ended with member nations adopting a 23-point resolution committing them to launch public health campaigns, step up screening at border checkpoints and airports and create “specialized teams” to craft a national strategy to the disease in the event that it crosses the Atlantic. A new poll on Brazil’s presidential field by Datafolha suggests that President Dilma Rousseff has gained some ground on her challenger Aecio Neves. The poll found 52 percent for Rousseff, compared to 48 percent for Neves. While the president’s lead is still within the margin of error, Veja notes that this is the first time that her support has been higher than Neves’ since the runoff phase of the race. In an op-ed in today’s New York Times, Folha columnist Antonio Prata criticizes what he sees as his compatriots’ collusion with everyday corruption and low-level tax evasion schemes, even as they criticize politicians for more egregious versions of the same actions. Panama has suspended a Supreme Court justice accused of using his proximity to former President Ricardo Martinelli to his own economic benefit, charges that have been bolstered by the revelation that he owns multiple luxury apartments that are seemingly outside his official pay range. Analyst James Bosworth takes a look at Venezuelan President Nicolas Maduro’s flagging popularity, with a new Datanalisis poll showing that 30 percent approve of his administration and 68 percent do not. Even more telling is the fact that 82 percent of Venezuelans say the country is not heading in a positive direction. After meeting with the wife of imprisoned Venezuelan opposition leader Leopoldo Lopez on Friday, UN High Commissioner for Human Rights Zeid Raad al-Hussein called on the government to release him and more than 69 other people detained since protests broke out earlier this year. In an update of the race for OAS Secretary General, yesterday the government of Argentina officially endorsed Uruguayan Foreign Minister Luis Almagro for the job, El Observador reports. Argentina joins Chile, Brazil, Paraguay and -- of course -- Uruguay, meaning the entire Southern Cone is united behind the candidate. The Washington Office on Latin America features video footage of a recent panel discussion at the Brookings Institute regarding the impact that the U.S. trend towards marijuana legalization has had on international drug policy reform efforts. On the Americas, Lisa Sanchez Ortega offers a solid rundown on the progress of reforms in the hemisphere, noting initiatives in Chile, Argentina, Uruguay, Mexico and the Caribbean. The Miami Herald looks at a planned Clinton Global Initiative event in Miami this December, which former President Bill Clinton is set to unveil later today. The event is slated as an opportunity to reflect on the 20 years since the first Summit of the America, and as a way for policymakers and experts to assess what the next 20 years holds for the Americas. While the United States criticizes Bolivia for permitting coca cultivation for cultural and medicinal purposes, authorities there have held up record-low levels of coca growth as proof that the Andean country has adopted an unorthodox but successful approach to fighting drug trafficking. However, critics of Bolivia’s “coca yes, cocaine no” policy have responded by pointing to the prevalence of corruption and a rise cocaine smuggling networks. In a stimulating new investigation that is sure to fuel such arguments, InSight Crime’s Jeremy McDermott asserts that the country is becoming a “center for drug trafficking in South America,” a “fertile ground” for transnational organized crime. The InSight Crime investigation, published to coincide with Bolivia’s October 12 general election, is the result of a recent visit to the country. There, McDermott spoke with Bolivian drug czar Sabino Mendoza, who asserted that the government of Evo Morales is effectively responding to the transnational criminal threat. A Santa Cruz trafficker familiar with the country’s underworld disagreed, however, describing the ease with which judges and police can be bribed -- even contracted -- by criminal groups. McDermott also witnessed Bolivia’s famously porous and corrupt prison system firsthand, which he describes in gritty detail in a profile of the “maximum-security” Palmasola prison in Santa Cruz. Particularly interesting is his rundown of the prices associated with bribes for certain privileges in the prison, including “fees” like a $1 charge for overnight visitors and a mandatory $250 per month to rent a cell. In an analysis of Bolivia’s overall vulnerability to organized crime, McDermott asserts that the country is being impacted by changing drug trafficking patterns. These include the increasing numbers of Colombian networks shifting operations to Bolivia as a result of repression in their home country, and the emergence of Brazil and Argentina as lucrative markets for Bolivian cocaine and cocaine paste. According to McDermott, Bolivia is “the major supplier” of cocaine paste to these two countries. These trends are complicated by factors like police corruption and a lack of effective border controls, which are among ten risk factors identified by McDermott. Since its publication last week, the InSight Crime piece has begun to make waves in Bolivia. News portal Eju.tv , for instance, cross-published the investigation in Spanish. The La Paz-based daily Pagina Siete has mischaracterized the report somewhat, with a title breathlessly exclaiming that McDermott had revealed that Bolivia “is the epicenter of drug trafficking.” La Prensa has seized on the piece’s reporting on the cocaine paste market in Argentina and Brazil. And Sunday’s edition of newspaper La Razon featured an overview of the investigation, noting McDermott’s characterization of drug trafficking as a primary challenge for Evo Morales’ new term. In other Bolivia news, electoral authorities yesterday officially declared President Evo Morales the winner of the October 12 presidential election, receiving 61 percent of the vote compared to 24.5 for Samuel Doria Medina. However, La Razon reports that the breakdown of the next Congress is still in doubt, and a final tally will not be available until after voting is re-held in 44 polling centers in Santa Cruz and Oruro departments. The paper also notes that two smaller opposition parties, the Bolivian Green Party and Movement Without Fear (MSM), fell short of the minimum 3 percent of the vote required to be recognized as official political parties. The New York Times has the latest on Brazil’s emerging Petrobras corruption scandal, which allegedly involved the company paying kickbacks to leading politicians, primarily of the ruling Workers’ Party. If these allegations prove true, the paper claims that the scandal would dwarf even the infamous mensalão case. The Wall Street Journal notes that the drought in São Paulo state has become a campaign issue ahead of Sunday’s second-round vote, with President Dilma Rousseff blaming her rival Aecio Neve’s Brazilian Socialist Democracy Party of adopting policies that led to the crisis. According to El Espectador, Colombia’s Attorney General has determined that the deaths of 34 members of the FARC-linked Patriotic Union (UP) party in the 1980s and 1990s constitute crimes against humanity, meaning that they are not subject to statutes of limitations and can still be prosecuted. Semana magazine reports that Deputy Attorney General Jorge Perdomo told journalists that the state is committed to investigating these cases. Gustavo Gorriti of Peruvian investigative news site IDL-Reporteros looks at the resurgence of Shining Path rebels in the coca-growing VRAE region. Pointing to a copy he obtained of an internal strategy document written by the guerrilla group, Gorriti argues that the Shining Path is attempting a revival of its activities based on specific lessons learned from past failures. The AP looks at the difficulties of historical memory and reconciliation in Argentina, profiling the effect that an investigation into a detention facility in the town of Olavarria, as well as the discovery that a local music teacher was the lost grandson of the head of the Grandmothers of Plaza de Mayo ,has had on its townspeople. More than three weeks after their disappearance, authorities in Mexico still have not located the 43 students who went missing after clashing with police in a protest against education reforms in Iguala, Guerrero. The NYT notes that officials say at least five mass graves have been uncovered nearby, but that none of the remains have been linked to the students. According to the paper, some analysts say the search is hampered by a lack of centralized authority in the country’s rural areas. Mexico’s federal police have assumed control of 13 municipalities surrounding the town of Iguala. According to Milenio, all of the towns are in Guerrero state but one, located in neighboring Mexico state.